Every small business owner in the country has a dream of becoming a hugely wealthy and successful businessman with a company and branding that is known all over the world. The primary reason why 85% of small businesses cease to exist after 10 years is that they are not able to expand, and change is the only constant. Either your business is growing, or you cease to exist – eventually. You can target new markets and verticals, but SME owners are notoriously resistant to expand at the cost of diverting their attention and resources from existing customers. So the question comes down to this – How to do business expansion without spending? The answer is that you expand your business through different networks that you have access to. 1. Business to business (B2B) sales through a distribution network. If you’re not already doing this, then you will soon. Selling directly to consumers (B2C) increases your customer acquisition costs and limits your reach. Once your business has grown to a point where you know all the major distributors and retail networks, start tapping into them to reach large consumer markets that you cannot do by yourself. The video below shows SME industry leaders discussing how to build a distribution network. This is from the Biz Summit event held at Evoma OMR last year. 2. Business to network to business (B2n2B). To take the point above one step further, let’s look at how to connect with large numbers of distributors and other businesses in your industry or sector. This will save you the time and resources needed for B2B marketing. Sound interesting? Actually, this is what everyone already does, but maybe you don’t do it at scale, and by targeting the right type of B2B partners. For example, it’s likely you are already on LinkedIn and Twitter (personal as well as business), but you may just be connecting randomly with people you know and meet. Instead, come up with a targeted list of distributors, retail chains and other businesses you would like to market and sell to. Start connecting and engaging with them person-to-person on LinkedIn and Twitter. Facebook is good for direct B2C, but you can generate solid business leads on LinkedIn. Twitter is a great platform for connecting with the biggest influencers, media and publishers, and the business leaders in your industry. Another thing you can do is B2B networking and branding at events. Getting to meet and connect with a large number of businesses, distributors and other potential partners is the primary aim of attending events. But sponsoring the largest events in your field provides your business with the brand building that you can’t get by marketing directly to your customers and through online media. Most importantly, being seen at an event with the organizers positions you as an industry leader, standing on stage for a presentation or a panel. It’s also a good way to create buzz on social media, blogs and through press releases. 3. 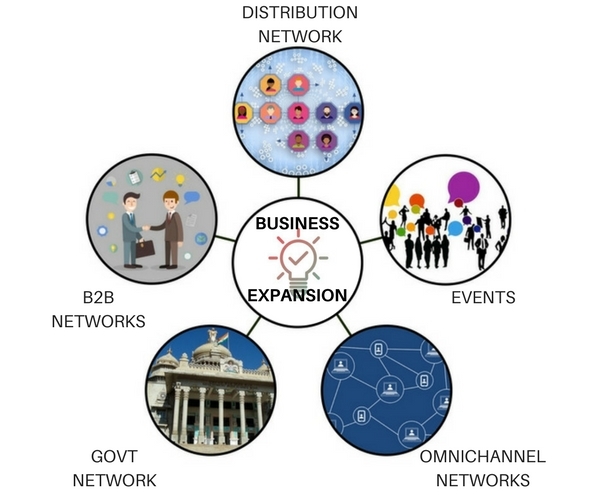 SME business expansion to government (B2G) networks. The government wants to support SME growth by allowing small scale industries to apply for government contracts. If you’re interested, just apply here. Fulfilling the eligibility requirements that get you listed as a government-approved vendor and enables you to apply for tenders. It also makes you eligible for government loans and other SME funding schemes at low interest, and even private banks and investors will be more willing to give you all the financing you need for business expansion. 4. Omnichannel networking with customers. You call your customers, or they call you. If they send you an email Request for Proposal (RFP), then you respond back with a proposal by email, post or fax. Then you follow up by phone or email, oor visit in-person. In between, they may call you or send an email. There’s also social media, SMS, Whatsapp, website forms, mobile apps and other customer engagement channels that you may have to maintain. It’s hard to keep track of the conversation across all these channels, and gets chaotic and expensive when there are multiple decision makers. The solution is omnichannel networking, wherein the system manages the switch between these channels. As far as you and the customer is concerned, it’s a simple and ongoing conversation. Implement this omnichannel system will allow you simplify your marketing and sales process, and leverage your resources to expand your business without having to allocate bigger budgets for marketing and sales teams.